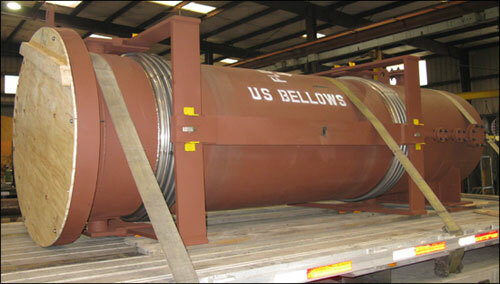 U.S. Bellows designed and fabricated a 180″ long double gimbal expansion joint with a 90° elbow and flanged and flued head bellows, and a 114″ long single hinged expansion joint with flanged and flued head bellows. After performing a pipe stress analysis on the line, it was determined that spring supports were necessary, so F-Type variable spring supports were also provided for this project and shipped with the expansion joints. All material in contact with the service fluid is fabricated from 304 H stainless steel and all external hardware is 304 stainless steel. 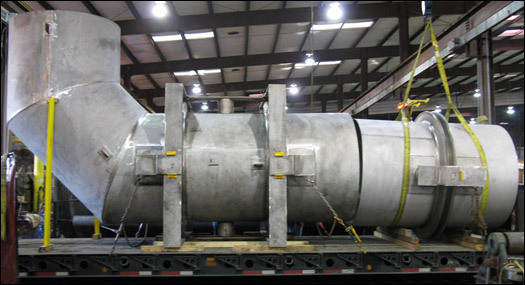 The expansion joint bellows is designed for 5° angular movement and 1100°F at 10 psig. A spot x-ray test, soap and air test, and 100% dye penetrant examination on all welds were performed prior to shipment. This gimbal expansion joint is designed for angular rotation in two planes of up to 4° in each plane. It has an overall length of 140″ with a total assembly weight of 11,000 lb. It is fabricated with 316 stainless steel bellows and carbon steel piping. 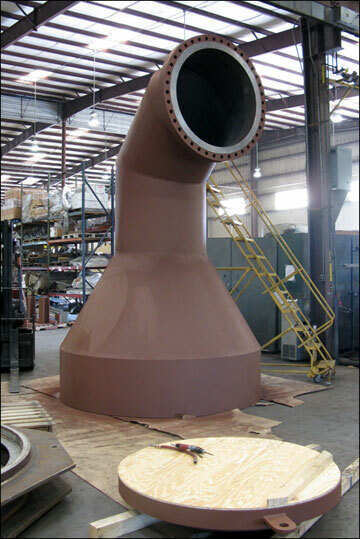 This expansion joint was 100% dye-penetrant examined and hydro-tested prior to shipment. U.S. Bellows, Inc. and Piping Technology & Products, Inc. also furnished the spring supports and pipe attachments for this project.